(John Dunning Political Collection, OHS). Born near Bluffs, Scott County, Illinois, on December 30, 1877, U.S. Sen. William Bliss Pine was the son of William G. and Margaret Green Pine. Following his graduation from the Naples, Illinois, high school in 1896, the future senator taught school in his home state for three years. He also sold harvesters during the summer months. Deciding that he could make more money selling grain binders, he became a full-time traveling salesman with the D. M. Osborne Company. While working in Neosho County, Kansas, he was caught up in the oil fever associated with the discovery of the Chanute field. In 1903 he left the Osborne company and Kansas and moved to Cleveland, in Pawnee County, site of another oil boom. He obtained a job with the National Supply Company, a firm that distributed oil-well equipment. During this time, he also took a geology correspondence course and learned how to apply this scientific methodology to petroleum exploration. Over the next few years he was involved in leasing land for oil companies in various parts of Oklahoma. In 1909 he moved to Okmulgee and became party to a lucrative leasing venture that gave him financial security. Often characterized by his frugality, he apparently decided he could now marry his high school sweetheart, Laura M. Hamilton. The Pines married in 1912; they had one son, William H. In Okmulgee, Pine became one of the state's leading independent oil producers. In addition, he presided over various Okmulgee businesses and had a major interest in a bank. 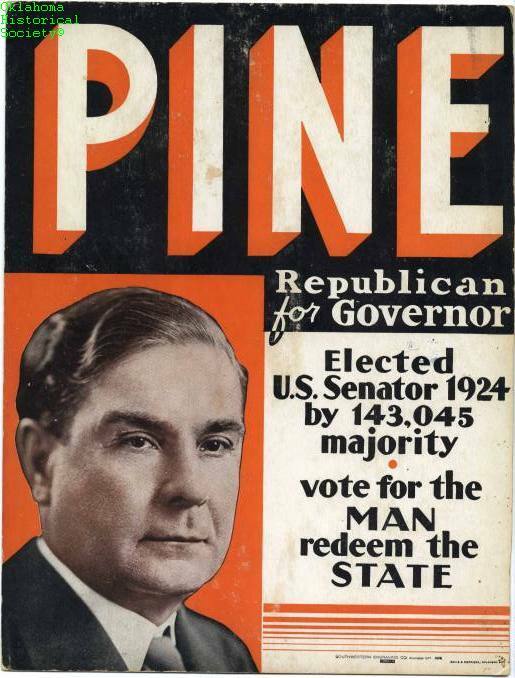 Although Pine had dabbled in Republican Party politics at the local level, in 1924 he decided to campaign for the U.S. Senate seat being vacated by Robert L. Owen. Opposed by the discredited former governor Jack Walton, Pine spent much of the campaign denying Walton's charges that he was a supporter of the Ku Klux Klan. He easily defeated Walton, thus joining fellow Republican John W. Harreld in the Senate. This was the first time in state history that Oklahoma had two Republican senators. As a senator, Pine had a rather inconspicuous career. Called a "regular Republican" for his general economic stance, the senator tended to side with the Progressive part of his party on matters related to agriculture and foreign affairs. While in the Senate, he served on various committees, including Civil Service, Claims, Interoceanic Canals, Interstate Commerce, Military Affairs, Appropriations, Banking and Currency, and Indian Affairs. He supported protective legislation for the petroleum industry and fought to bring federal road projects to the Sooner State. In 1930 the Great Depression was beginning to cast its long shadow on the country. Many blamed the economic woes on the Republican Party. Even Pine tried to distance himself from the national party. Although he mounted a very modern campaign, complete with a fifteen-minute movie, he was defeated by Thomas P. Gore. Returning to Okmulgee, Pine continued with his various business pursuits. He also purchased several thousand acres along the Deep Fork River, and he had an extensive agricultural operation, including a large and nationally successful hog-raising venture. In 1938 he was elected to the Oklahoma Hall of Fame. In 1934 he staged an unsuccessful political comeback with a campaign for the governor's office against Democrat Ernest W. Marland. The former senator made one final attempt for public office when he ran for the U.S. Senate in 1942. On August 25, 1942, only six weeks after he won the Republican primary, Pine died of a heart attack in Okmulgee. He was interred in the Okmulgee Cemetery. Maynard J. Hanson, "Senator William B. Pine and His Times" (Ph.D. diss., Oklahoma State University, 1983). Stephen Jones, Once Before: The Political and Senatorial Careers of Oklahoma's First Two Republican United States Senators, John W. Harreld and W. B. Pine (Enid, Okla.: Dougherty Press, ca. 1986). The National Cyclopaedia of American Biography, Vol. 40 (New York: James T. White & Company, 1955). William Bliss Pine Papers, Congressional Archives, Carl Albert Congressional Research and Studies Center, University of Oklahoma, Norman, Oklahoma. Carolyn G. Hanneman, "Pine, Wiliam Bliss," The Encyclopedia of Oklahoma History and Culture, https://www.okhistory.org/publications/enc/entry.php?entry=PI009.